Ah. ‘The Zygon Inversion’. How do I analyse thee? Let me count the ways. Remember, this is the stuff the BBC DON’T WANT YOU TO KNOW ABOUT, so you’re very lucky to have me on hand to reveal the Hidden Truth. And there is a lot of hidden truth this week; enough to kill a small horse. 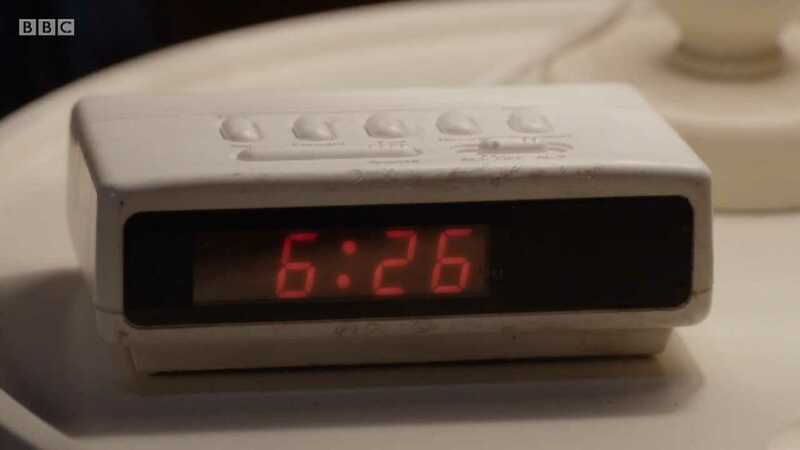 Let’s take a look first of all at the clock in Clara’s flat, at the very beginning of the episode. Written out in this manner this is CLEARLY a conversation between a deity and a poor Earthbound worshipper asking for help, and this is a theme that develops further when the number ‘626’ is interpreted in other ways. The notion of mythological deities also figures when we examine episode 626 in the chronological run – part four of ‘The Twin Dilemma’, a story featuring twin boys named Romulus and Remus, both conceived with the help of the god Mars. And it goes further. Consider season 6, episode 26 of the original run: episode three of ‘The Seeds of Death’, an episode which concludes with a pod that hides a deadly secret, in a story about malevolent warriors from the planet Mars, which features a character named Osgood. NONE OF THIS IS A COINCIDENCE. Pokemon Red and Blue are two different entries in the phenomenally successful Japanese series, in which players capture monsters inside golf-sized balls that are clearly bigger on the inside. The Red and Blue Design Hotel is in Prague, a city visited by at least nine incarnations of the Doctor. And in football, Crystal Palace FC are known as the Red and Blue Army; the Crystal Palace was visited by the Eighth Doctor and C’rizz in ‘Other Lives’, and thus this is a CLEAR AND UNAMBIGUOUS clue that the Eighth Doctor WILL BE IN THE SERIES FINALE. Also of note: the Mire helmet, secured behind glass. Note that when the word ‘Mire’ is reversed (or INVERTED) it reads ‘Erim’, the name of a village in Turkey and also the surname of a number of at least two Turkish academics and one politician. We may therefore conclude that Mr Copper, the clueless tour guide from ‘Voyage of the Damned’, who believed that the people of Earth went to war with Turkey every December, will cameo in the Christmas special. There is no possible alternative. Just don’t tell anyone; the press leak is presumably still pending. 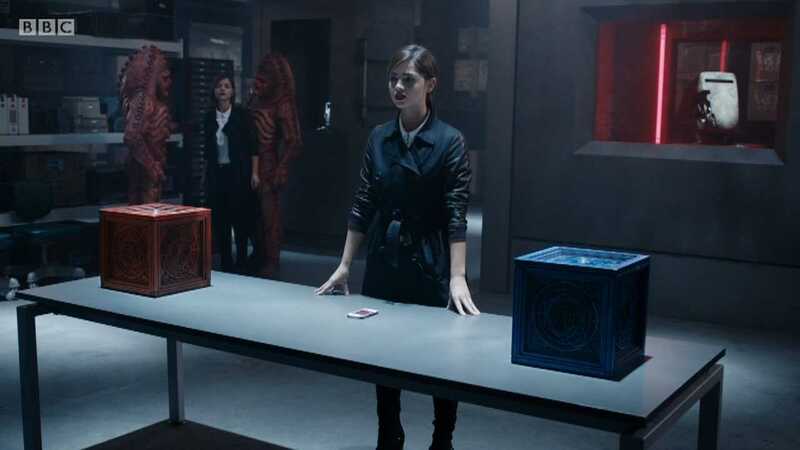 Note the ROSE-coloured bottles of Rubicon hidden just behind the poor Zygon. In ‘Tooth and Claw’, the Tenth Doctor offers to take Rose to observe ‘Caesar crossing the Rubicon’. Note also that both of actors were in ‘Day of the Doctor’, although Billie Piper played a character with a different name who looked like Rose, just as this week Jenna Coleman played both Clara Oswald and someone who looks like her. Note that in ‘Tooth and Claw’ the Doctor and Rose meet Queen Victoria. Note that Queen Victoria is shortly to be played by Jenna Coleman. 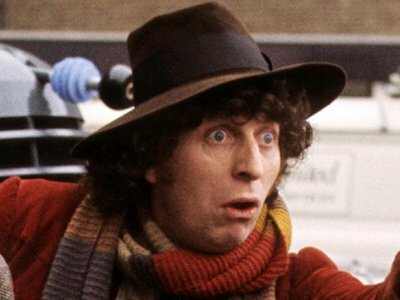 Note that Zygons have claws. Sort of. That’s enough notes to be going along with. My brain hurts. Not-quite finally, observe Clara’s lounge / sitting room / snug / living room. Finally, class, here’s your homework. I know we don’t tend to give homework but your task – should you choose to accept it – is to decode this. Just the headline in red, that is. I know what it means already, and I’ll tell you next week. But let’s see who can figure it out before I reveal the answer. First correct guess wins my seal of approval, and also a lollipop. A rose-coloured one. Go on, get cracking.